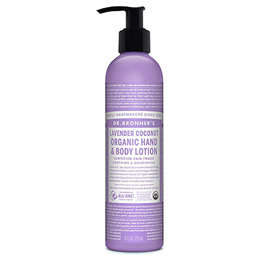 Dr Bronner`s Organic Lavender Coconut Hand & Body Lotion contains organic jojoba oil which moisturises dry skin exceptionally well, due to its unique similarity to the skin`s natural oils. Aqua, Organic Cocos Nucifera (Coconut) Oil*, Organic Simmondsia Chinensis (Jojoba) Seed Oil, Organic Ethanol, Organic Persea Gratissima (Avocado) Oil, Organic Cannabis Sativa (Hemp) Seed Oil, Organic Quillaja Saponaria Extract, Xanthan Gum, Tocopherol, Lavandula Angustifolia (Lavender) Oil. Below are reviews of Dr Bronner`s Organic Lavender Coconut Hand & Body Lotion 237ml by bodykind customers. If you have tried this product we'd love to hear what you think so please leave a review. True organic products. Moisturiser that leaves no residue. Skin loves this product. Dr Bronner`s Organic Lavender Coconut Hand & Body Lotion contains organic jojoba oil which moisturises dry skin exceptionally well, due to its unique similarity to the skin`s natural oil.